Service on the northern train line to Chiang Mai will be suspended for 45 days starting from Monday, as the State Railway of Thailand (SRT) carries out badly needed repairs after a dozen accidents this year. All northbound trains from Bangkok will end at Sila At station in Muang district of Uttaradit from Monday until Oct 31, the SRT said. The closure affects all rapid and express trains to and from the popular northern city. Travellers will have to take buses or other transport to Chiang Mai. Regular service will resume on Nov 1 and by then SRT governor Prapat Chongsanguan has promised no more derailments. The SRT is providing free bus service on Transport Co vehicles to Chiang Mai from Sila At only for passengers who reserved their tickets before Sept 6, the day that the railway agency announced the closure. That same day it stopped selling tickets to other stations beyond Sila At, an SRT Call Centre official explained on Saturday. Passengers can contact the SRT at 1690 for more details. The service suspension comes after 13 accidents on the northern tracks this year. The last one was on Sept 5 when an express train to Bangkok from Chiang Mai jumped the tracks in Long district of Phrae province. 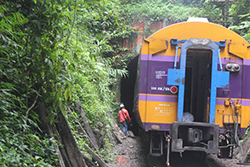 All accidents on the northern tracks occurred on the section between Uttaradit and Lamphun, and have been attributed to the mountainous terrain, and old tracks and sleepers which need urgent maintenance. The government has set aside a budget of 2.8 billion baht to fix the tracks and sleepers on the 300-kilometre stretch between Uttaradit and Chiang Mai. The SRT originally planned to make repairs step by step while continuing to provide service in order to not cause trouble for passengers on northern trains. But the number of accidents this year forced it to shut down the entire service at length. The financially ailing state rail operator has been battered by accidents this year, the latest one on Friday when the express train from Butterworth, Malaysia, derailed shortly after leaving Bang Sue junction in Bangkok for Sam Saen station. An SRT report shows 114 train derailments - some major but many minor incidents that escaped media attention - took place from January to last Friday. The figure is up sharply from last year when only 89 accidents were reported over the 12-month period. 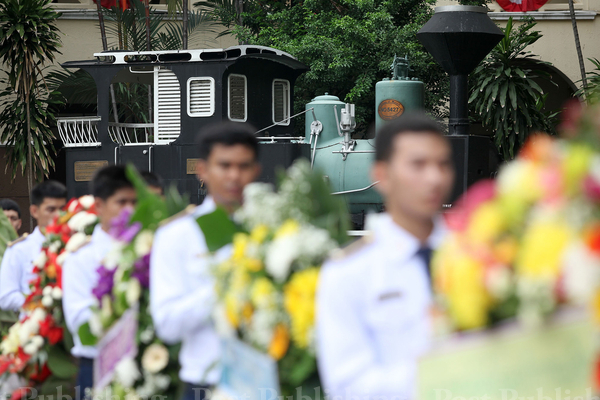 Railway officials led by Transport Minister Chadchart Suttipunt and the SRT governor attended a merit-making ceremony at the head office near Hua Lamphong on Saturday as the SRT celebrated its 117th year. The event was also intended to boost sagging staff morale in the wake of the numerous accidents. Mr Prapat admitted that train passengers' confidence had been plunging and blamed a budget shortage and old tracks on the problems. The lack of government attention partly caused the accidents, he said. "Governments have placed a priority on road expansion and maintenance," he said. "Budgets requested by the railway agency have always been slashed because the decision makers on the budget didn't understand the problems of railway transport. "The train is the safest mode of transport and that is possible only when it is regularly maintained." He said on Friday that the agency was looking for an artist to restore a 48-year-old painting at the SRT headquarters amid rumours that the damaged artwork was a bad omen that had caused accidents. The SRT was set up in the reign of King Rama V. Thai railways are among the oldest in Asia and development is going in a slow mode. The country has a train network of 4,043 kilometres, 93% of it single tracks. The rest are either the double or triple tracks. Passenger traffic on the rail system has fallen by 40% since 1992 and freight traffic has dropped 30% since 2002, according to a report by the Asian Development Bank. The SRT has 100 billion baht in accumulated losses and has not done maintenance on some parts of its network for 30 years. Its rolling stock is in equally poor repair and the subject of frequent complaints about cleanliness. The government intends to overhaul the country's rail system at a cost of 1.12 trillion baht as part of its 2-trillion-baht infrastructure programme. As part of the upgrade, the SRT would be asked to set up a separate agency to run a new high-speed rail business. Chor Muang (Thai Steamed Dumpling) Traditional Thai Appertizer. Today I had a very special menu Chor Muang -( Thai Steamed Dumpling) is royal Thai Cuisine which is required for refinement. It show the unique Thai art and deserves to preserved. The flavor could be make with pork, shrimp, or chicken filling stir-fried with coriander root, garlic and pepper. "Chor Muang" is a unique desert of Thailand , is completed and worthy of conservation. The way to do that is through the use of hands to hold the shape of the pleat. Foods with high humidity, can not be stored for long that is why Chor Muang can be difficult to find. 11. 1 Cup Vegetable Oil. 1. Pound coriander root, garlic and pepper thoroughly. 2. Heat the oil. Add the mixture above (ground garlic, coriander root and pepper)stir - fry until fragant. 3. Add chicken, onion and stir to combine. 4. Season with fish sauce, palm sugar, sugar, salt and chicken stock or water. Taste and leave to cool. * Anchan water is Butterfly pea flower soak in warm water. * Coloring for this appetizer is obtained from Butterfly pea flower . 1. Knead rice flour, tapioca flour, Arrowroot flour together with Anchan water. Then add oil and stir to combine. 2. Stir constantly in a brass pan until the mixture become opaque and is done. Remove from heat. . Add in some starch for kneading. Knead until the mixture form a smooth elastic dough that don't stick to your hands. 3. Divide the dough into equal pieces. Cover and make like a flower shape with tweezer. and everyone having fun making them. Some of them are beautiful and some of them are special.! 4. Steam in banana leaves for about 5 minutes. Sprinkle with garlic oil. 5. Serve with lettuce or fresh coriander and chilli.